In today’s world of a highly commercialized-consumerist culture we are constantly bombarded by information. The control of the corporatocracy is so great that even within the safe confines of our homes, we are exposed to the mass consumerist subconscious programming. There are endless examples of individuals who have a constant meditation and yoga practice, yet they are enable to make serious headway in their process of self realisation. It is this one extremely important missing element that is the primary cause of this problem. Before we delve into discussing what this limb of yoga is, let’s take a simple example of the primary cause of urbanization. The highly commercialized-consumerist culture has not been ever existent. In the last 100 years we have consumed more than half the worlds top soil, half the oil and half the rain forests. There is a very strong reasoning that goes to the root of this problem. The first public radio broadcast took place in the first decade of the 20th century. Thirty years after that the television was born. These tools of media gave immense power to those who held the rights of transmission. Let us picture the life of a simple village farmer. The farmer was happy living in his sustainable, uncomplicated life. His primary exposure was confined to the soil, the ecology of the village and the village community gossip. With the advent of the radio the farmer began to hear tales of lands far beyond his own. The emergence of television showed him beautiful women, places, activities urban people engage themselves in and a plethora of other sights and sounds. Desire and unhappiness crept into his life. The exposure to such variegated lifestyles created want in his mind. This cycle of wants and needs has progressed to increasingly dangerous levels. Not only for each individual but for human civilization as we know it. In the information age we are now overexposed on every sensory level. The problem is that the senses, like untrained children, have their own will which is largely instinctual in nature. They tell the mind what to do. If we don’t discipline them, they dominate us with their endless demands. We are so accustomed to the ongoing sensory activity that we don’t know how to keep our minds quiet. Our commercially oriented system survives by stimulating our interests through the senses. We have become hostages of the world of senses and it’s allurements. We cannot ignore the role sensory impressions play in making us who we are, for they build up the subconscious and strengthen the tendencies latent within it. Yoga is a vast system of spiritual practices for self realisation. The classical system of Patanjali’s Raja Yoga incorporates eight limbs, each with it’s own place and function. Of these Pratyahara is probably the least known. There are no books, classes that discuss techniques and proper discussions on Pratyahara. In the eight limbs of yoga this is the transitional limb where we begin to gain mastery over our unruly senses and begin to focus our energies within. 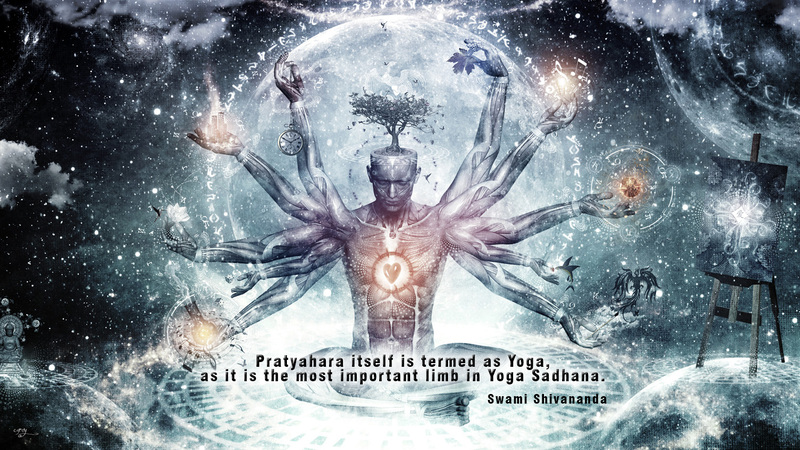 The term Pratyahara is composed of two sanskrit words, prati and ahara. Prati means “away” and Ahara means “food”. It literally translates to “gaining mastery over external influences”. We must understand the three different levels of food in yogic thought. The first is physical food which we use to nourish our bodies, the second is the mental impressions which nourish the mind through the five sensory perceptions and the third is the people we hold at the heart level who serve to nourish the soul and are highly influential in our daily lives. Practicing Pratyahara involves two different modes. The first is withdrawal from wrong food, wrong impressions and wrong associations while simultaneously opening up to right food, right impressions and right associations. Here wrong is defined as the force which takes us away from self realisation and right as the force which drives us towards self realisation. Pratyahara’s primary importance lies in control of the sensory impressions which frees the mind to move within. Anyone whose periods of mediation alternate with periods of sensory indulgence is in need of Pratyahara. Pratyahara centers on the right intake of impressions. Most of us are careful about the food we eat and the company we keep, but we may not exercise the same discrimination about the impressions we take in from the senses. We take in impressions from different forms of media that we would never allow in physical forms in our personal lives. The background of our mental field consists of our predominant sensory impressions. Just as junk food makes the body toxic, junk impressions make the mind toxic. Perhaps the simplest way to control our impressions is to simple cut them off and spend some time away from sensory inputs. Another method of sense withdrawal is to keep our sense organs open but to withdraw our attention from them. This is practiced in certain Buddhist meditation techniques and is a bit more difficult. Another method to cleans the mind is by focusing on uniform impressions like oceans, lakes, or the blue sky. We can also control the senses by creating positive impressions by meditating upon aspects of nature such as trees, flowers or birds. Positive impressions can also be created by using incense, flowers, altars and aspects of devotional worship. Trying to practice meditation without some degree of Pratyahara is like gathering water in a leaky vessel. The senses are like holes in the vessels of the mind. Unless they are sealed the mind cannot hold the nectar of truth. Thank you for deciding to follow my blog. This has led me to find this beautifully written post. I will be exploring more as soon as I have time. Thank you for the kind words of appreciation. It’s an honor to resonate with one as wise as you. Looking forward to exploring the variegated knowledge that is shared by you on your blog. It is highly intriguing. I think of true yoga as the union or as I like to think of it as the melding of mind and body. As I believe that mind is synonymous with consciousness and spirit I understand this as the most important limb and knowing yourself is the tool which we use to put that limb to the best use possible for each individual on the quest for happiness … and thanks for your visit. Thank you for stopping by and sharing your wisdom David. It is most pleasing to witness how your own insight of reality has taken you to such depths of understanding. Understanding the mind may truly be the most important step in self realisation. To my experience it has required a lot of stillness even just to begin the process and ‘Pratyahara’ really helps with that. I wish for you eternal bliss. Namaste.